Four games on the Sunday prospect schedule with a mixed bag of results but at least there was some entertaining hockey to watch thanks to the various matchups. The New York Ranger and New York Islanders both saw 3 of their prospects in action on Sunday and only 1 did not have an effect on the outcome of his team's game. A rare Sunday college hockey matchup saw 4th ranked Notre Dame hosting Michigan Tech in the 2nd game of their weekend series and while Friday's game was a close game that was not the case on Sunday as Notre Dame took advantage of power play chances (going 4 for 12) to defeat Michigan Tech 7-3 to improve to 4-0 on the season. 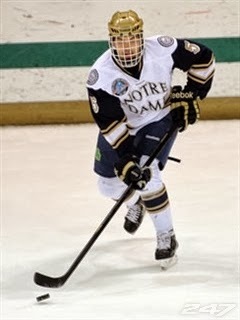 Notre Dame got 2 assists from junior Robbie Russo (NYI 2011 4th) and 1 assist from sophomore Steven Fogarty (NYR 2011 3rd) to help with their attack. All of these assists came on different power plays even if they were secondary assists. Russo got the first assist as part of Notre Dame's 1st goal of the game at 16:48 of the first period giving Notre Dame a 1-0 lead that they would take into the intermission. In the 2nd period with the score tied 2-2, Steven Fogarty registered his assist on Jeff Costello's goal at 11:11 which broke the tie giving Notre Dame a 3-2 lead. Just 18 seconds later at 11:29 with Notre Dame still on the power play, Russo would earn his 2nd assist on Mario Lucia's goal which made it 4-2 and would prove to be the game winner. Russo earned the game's 3rd star for his play as he is now 2-2-4 after 4 games all wins for Notre Dame. Steven Fogarty earned his first assist of the season to improve to 1-1-2. Anthony Duclair (NYR 2013 3rd) had a mixed game for his Quebec Remparts as they lost to the Acadie-Bathurst Titan 5-4 in the shootout. Duclair had a goal and an assist but was a -2 on 2 shots with 1 hit, a minor for cross checking and 1-0 on his faceoffs. There is no question that Duclair has offensive skill as in 10 games Duclair is 10-6-16 (20th in QMJHL points, 6th in QMJHL goals and 12th in QMJHL power play goals). It is in the other areas such as defense, on ice discipline and consistency which is where Duclair needs improvement. Game 2 of the back to back series between Griffin Reinhart's (NYI 2012 1st) Edmonton Oil Kings and Mackenzie Skapski's (NYR 2013 6th) Kootenay Ice went to the Oil Kings when Reinhart setup Henrik Samuelsson for the game winning goal 41 seconds into overtime giving the Oil Kings a 3-2 overtime win. The Oil Kings earned a split in the series with the win. Reinhart's assist was his 3rd of the season giving a 1-3-4 mark since returning to the Oil Kings from the Islanders. Skapski let his emotions get the better of him as he took a costly slashing minor at 18:37 of the 3rd period which helped the Oil Kings cash in a goal 4 seconds after the penalty expired in overtime. Skapski saw his numbers go to 5-3-2, a 2.87 goals against and a 0.906 save percentage. Finnally Loic Leduc (NYI 2012 4th) and his Cape Breton Screaming Eagles dropped their 3rd straight game falling 7-3 to the Val-d'Or Foreurs. Leduc took a costly minor that the Foreurs cashed in for a 2 goal lead and the Screaming Eagles could never catch up after that.